A natural-born trapper and hunter raised in the Alaskan wilderness, Tracy Petrikoff spends her days tracking animals and running with her dogs in the remote forests surrounding her family’s home. Though she feels safe in this untamed land, Tracy still follows her late mother’s rules: Never lose sight of the house, never come home with dirty hands and, above all else, never make a person bleed. But these precautions aren’t enough to protect Tracy when a stranger attacks her in the woods and knocks her unconscious. The next day, she glimpses an eerily familiar man emerging from the tree line, gravely injured from a vicious knife wound—a wound from a hunting knife similar to the one she carries in her pocket. Was this the man who attacked her and did she almost kill him? With her memories of the events jumbled, Tracy can’t be sure. Helping her father cope with her mother’s death and preparing for the approaching Iditarod, she doesn’t have time to think about what she might have done. Then a mysterious wanderer appears, looking for a job. Tracy senses that Jesse Goodwin is hiding something, but she can’t warn her father without explaining about the attack—and why she’s kept it to herself. It soon becomes clear that something dangerous is going on . . . the way Jesse has wormed his way into the family . . . the threatening face of the stranger in a crowd . . . the bootprints she finds at the forest’s edge. Her family is in trouble. Will uncovering the truth protect them—or is the threat closer than Tracy suspects? The Wild Inside is a peculiar amalgamation of coming of age novel and psychological thriller that’s dusted with a sprinkling of romance and horror. The debut novel by Jamey Bradbury, the plot centers around the authors adopted state of Alaska and the Iditarod, an annual sled dog race that’s run from Anchorage to Nome. Bradbury has written articles for the Alaska Dispatch News and her award winning short fiction has appeared in several notable publications that include the Black Warrior Review. Be warned this is not the pretty side of Alaska and the main character, Tracey is not your average teenager. Loaded with realism, The Wild Inside delivers a perplexing portrait of a young woman on the edge whose life choices and transition to adulthood is fraught with complexities. 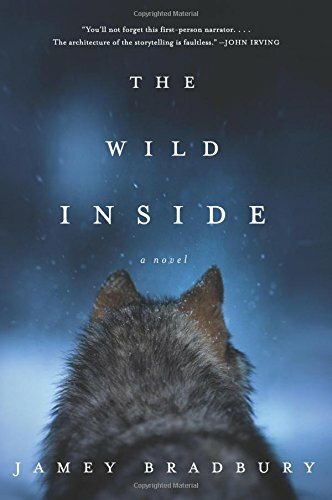 Overall, The Wild Inside is adequately written and paced, but was a little difficult to review because of its unique categorization and quirky plot lines. It was a challenge to determine whether the author intended the novel to be to be horror or tragedy. Overall, the reader will be fascinated by the setting and conclusion, and The Wild Inside is a recommended read for Alaska enthusiasts and those who like unique character development.